Uluwatu, one of The Bukit's most challenging surf spots. All photos by Anna Chittenden. author and photographer Anna Chittenden knows more than a thing or two about Bali, and just published an off-beat to the dreamy island. Here's her rundown of the Bukit Peninsula in the southern region. Bukit Peninsula, locally known as the Bukit, has been a magnet for surfers drawn to the region's endless string of perfect Indo-waves since the 1970s. While nomadic surfers still descend in droves, the cliffside villages have become a retreat for bohemian travelers looking to experience the laid-back side of Bali. 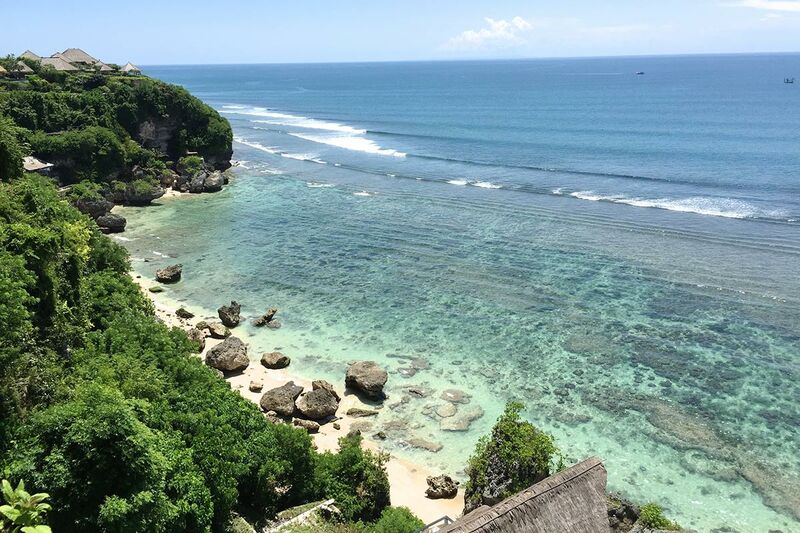 The Bukit is defined by its stunning shoreline with craggy limestone cliffs that tower over an azure-tinted ocean. The beaches are exactly how you'd imagine them to be in Bali: Cream-colored sand sweeps around a shoreline with piercing blue waters crashing on the coast. Steep cliff access means the beaches are quiet, aside from a sprinkling of cafes and local eateries called warungs. Days are spent perched on a surfboard, evenings are spent drinking Bintang beers at a ramshackled beach bar, and nights pass in a wooden Balinese bungalow on a cliff. Located in the southernmost point of the island, the Bukit is split into four major neighborhoods: Uluwatu is for die-hard surf fanatics. 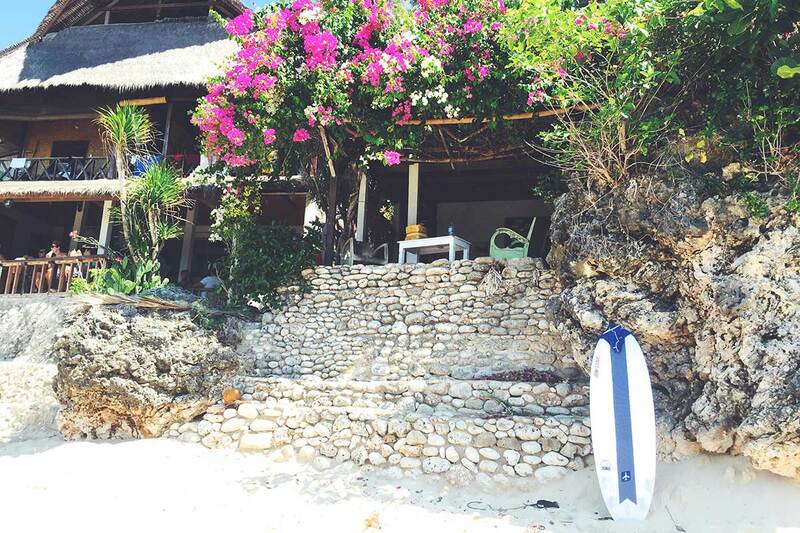 Bingin is where you'll find beautiful beaches and boutique hideaways. Balangan is a quiet and simple surf spot. And Jimbaran is fairly developed with high-end hotels but maintains historical sites like its traditional fish market. The view at Bingin Beach. 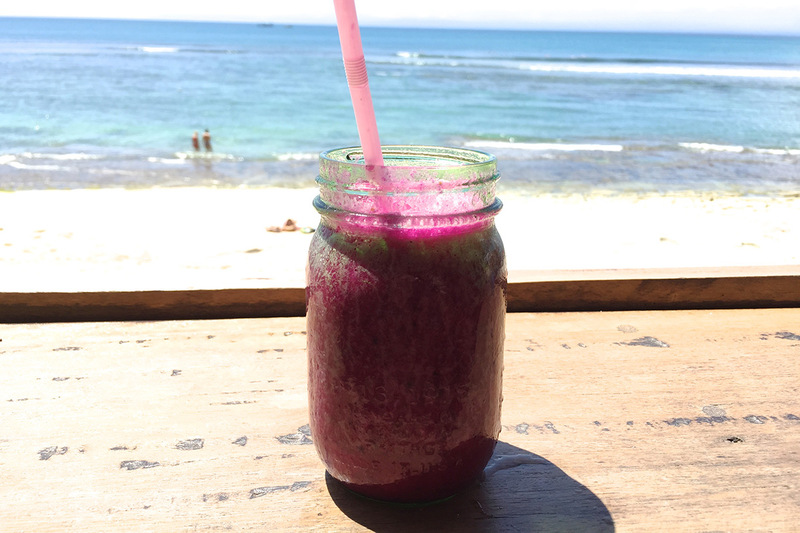 Dragon fruit smoothie at Kelly's Warung on Bingin Beach, Bali. Bingin Beach is one of my favorite beaches on Bali. Not only because it has soft white sand, crystal turquoise waters, and a lack of crowds, but also because it's one of those friendly, unpretentious places where travelers come and chat over dragon fruit smoothies at and trade travel secrets while sitting on their surfboards waiting for a wave. There's a secret beach that not many people know about called . It's hard to get to (you have to climb down 500 steps), but once you are there, you usually have the place to yourself, with perhaps a few locals spearfishing in the sea. Hungry surfers fuel up at Kelly's Warung. 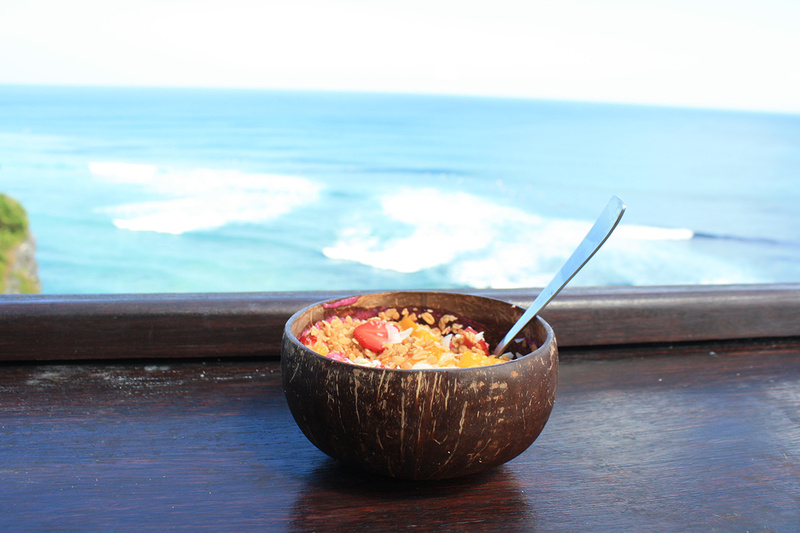 The Uluwatu bowl at Nalu Bowls. Drop-in vinyasa flow classes are held at the lovely every day at 7:30 a.m. and 10:30 a.m. This breezy open-air yoga studio is surrounded by lush foliage and situated high enough to enjoy views of the ocean. Along with the lovely Bingin and Nyang Nyang beaches, is another one to visit. The quiet and secluded beach in the small village of Padang Padang is the perfect place to relax and take in the glorious Bukit coastline. Come early in the morning for a swim and you'll have the sand and sea all to yourself. Not all beaches in Bali are suitable for swimming so this is a great spot. Bukit Peninsula is a surfer's haven. You are spoiled by choice when it comes to looking for the perfect break. Head to Uluwatu if you want a challenge or Bingin, Padang Padang, and Balangan if you are at the beginner to intermediate level. There are plenty of teachers around to show you the ropes. Slightly south of the surf breaks at Uluwatu Beach lies a Hindu temple locally known as Pura Luhur Uluwatu or . The draw isn't the structure itself (Bali has more impressive temples dotted around the island), but the striking scenery. Situated on a limestone cliff 70 meters above the roaring ocean, it's especially beautiful at sunset. One of the oldest in Bali, the sacred sea temple was originally built in the 11th century. The Bukit is lucky enough to have two fabulous live music evenings. If you're around during the week, head to The Cashew Tree for their Thursday Sessions and over the weekend for Sunday Sunset Sessions, where bands play against a backdrop of the Indian Ocean. The pool at ecofriendly resort Sal Secret Spot. A private pool at Acacia Bungalows. Start your day with a visit to the and kiosk at in Uluwatu. Nalu Bowls serves fruit-filled acai bowls in coconuts. My favorite is the Uluwatu, which comes with dragonfruit, banana, mango, and raspberry. Revolver Coffee has some of the best coffee on the island. The Bukit isn't know for its food scene (head to Seminyak or Ubud if you want more innovative cuisine), but there are several healthy, laid-back options perfect for hungry surfers. Refuel at on Bingin Beach for pink pitaya fruit bowls, raw vegetable wraps, and refreshing juices or for pumpkin tofu cashew curry and a raw cacao dessert. If you want fancier fare, book a table at at resort for traditional Indonesian cuisine with a modern twist and to-die-for views. For the finest meal in The Bukit, make note of . Headed by chef Kevin Cherkas, who previously worked at El Bulli in Spain, Cuca serves innovative cocktails and culinary tapas-style creations in the coconut groves of Jimbaran. The Bukit is filled with affordable, cute, and quirky boutique retreats. 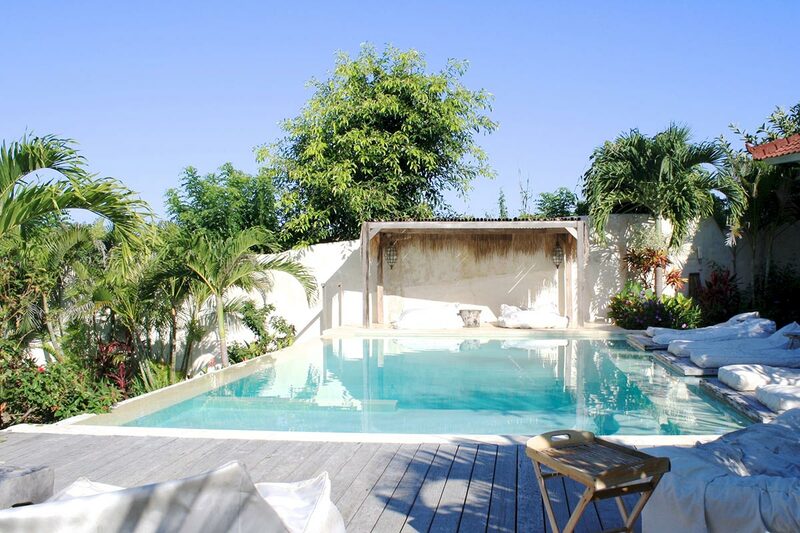 I love , a Mediterranean style B&B in Bingin with the option of pool or cliffside rooms. For more privacy, I like to stay at the gorgeous , where you have your own private pool, huge outdoor bathroom, and on-site spa treatments. From Ngurah Rai International Airport (DPS), the Bukit is around a 30-60 minute taxi journey, depending where you are staying. Ask your hotel to organize a taxi for you or catch one at the airport. Most people travel around on a moped (often with a surfboard strapped to the side). You can also hire a car. There are taxis, though you will need to book them in advance. There's no public transportation. 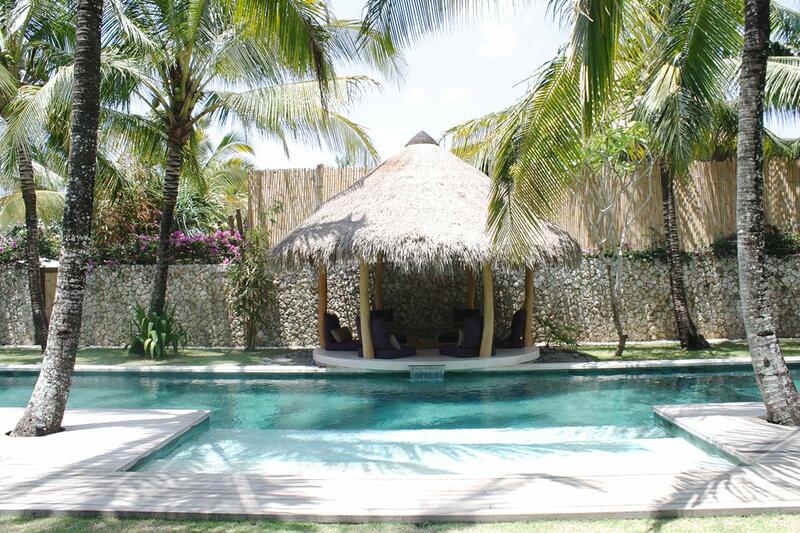 Bali is one of those destinations where the weather is nice year-round. Peak season is July and August when families visit during school break. November to April is officially wet season, although you often have days with bright blue skies. The tropical rains are heavy but brief. Anna is a Singapore based travel writer who documents her discoveries around South East Asia on her website . She recently published a travel guidebook called . You can follow her on and . She travels for the connections made with friends old and new.